Three great trails: the GR10, GR11, and the HRP cross the range from east to west. And that’s not counting the Saint-Jacques trails. Everywhere, from the Basque country to Catalonia, marked trails provide a range of opportunities for exploring the Pyrenees on foot, for both experienced and beginner walkers. A fabulous El Dorado for walkers! In 1807, botanist Augustin de Candolle went from Prades to Saint-Jean-de-Luz on a Pyrenees plant collecting operation. It is still a benchmark today. But the first complete crossing of the Pyrenees was made by Jean Bepmale in 1907 in 30 days. It was just the beginning for hiking. Since then, the range has become a preferred spots for walkers. The GR10 takes the north face, The GR 11 or La Senda are on the south face, and finally for more experienced mountaineers, there is the HRP (Haute Route Pyrénéenne) along the ridge. 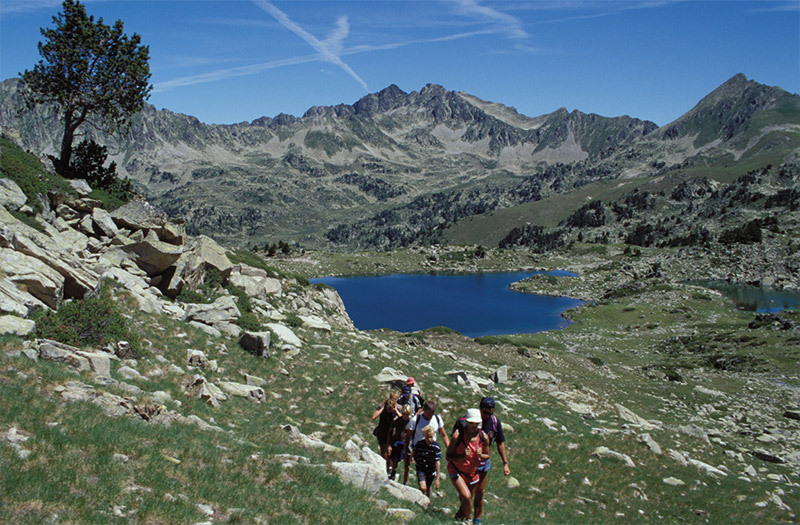 Apart from these three regal trails, each valley in the Pyrenees has a dense network of official walking trails, with reassuring markings, as well as more discreet trails in the mountains or on the piedmont plateaus. The Pyrenees has an abundance of treasures - lakes, cirques, forests, heritage, wildlife, flora, geology. A complete list of the trails is impossible. Spiritual walkers and history enthusiasts will choose the Saint-Jacques trails; or the Sentier Cathare which leads to the eponymous castles in Aude and the Pyrenees-Orientales. Don’t hesitate to call on one of our many mountain guides who are ready to share their passion and knowledge.